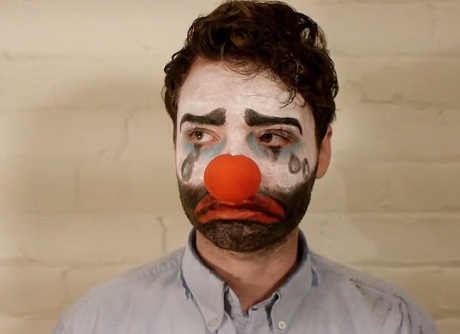 Bedroom funk auteur Homeshake (aka Peter Sagar) has fully embraced his clowning side, as his new video finds a young man putting his fate in the hands of a makeup artist he's sadly too into in the new video for In the Shower single "Making A Fool Of You." Ah, the things we do for love. As you'll see down below, the young man lets the woman he loves work her magic, with the sit-down session finding a make-up sponge smearing white across his forehead and tears down his cheeks. This is made even sadder considering the laid-back jam's constant reminder to him that she's "making a fool of you." Decide for yourself if, as explained in the clip, the young man's sporting a "modern" look or if he merely resembles a broken-hearted bozo. You'll find the video down below.